This is the third of five parts of The Last War in Albion Chapter Eleven, focusing on Alan Moore's The Ballad of Halo Jones. An omnibus of all eleven parts is available on Smashwords. If you are a Kickstarter backer or a Patreon backer at $2 or higher per week, instructions on how to get your complimentary copy have been sent to you. The Ballad of Halo Jones is available in a collected edition that can be purchased in the US or in the UK. Previously in The Last War in Albion: The editorially troubled second book of The Ballad of Halo Jones introduced the character of Glyph, a character so meek and unobtrusive that people don't even notice her when she's standing there, and forget about her even as she's talking to them, to the point where her roommates, Halo and Toy, don't even realize they have a third bunkmate. "One of the Culacaons detaches himself from the main herd and rushes screaming at the nearest mollusk. He stabs the exposed violet membrane over and over with his spear. Everyone cheers. Soon, his fellows join in, each assaulting the snail-thing of their choice. The atmosphere is overwhelmingly masculine." - Alan Moore, "A Man's World"
Glyph’s tragedy (they ultimately sacrifice themself to save Halo and Toy from Toby’s attack, with neither of the two noticing or remembering them after they’re gone) serves in many regards as a mirror for Halo’s own arc over the course of Book Two, which tracks her voyage on the cruise ship The Clara Pandy. Halo plans to meet Rodice on the planet Charlemagne after a year’s journey, a meeting that hangs over the entire arc from the first installment, which is narrated in the form of a letter from Halo to Rodice as she passes Pluto on her way out of the solar system. But upon reaching the appointed meeting place at the story’s end she discovers that Rodice changed her mind after Halo’s departure and is still back on the Hoop. Angry and betrayed, Halo responds to Rodice’s promise that “I’ll tell you everything when you get back to the Hoop” by proclaiming that she won’t be coming back to the Hoop and hanging up on her, leaving her, in her own way, as isolated and cut off as the forgotten Glyph. Certainly the character was a success. In stark contrast to Book One’s chilly reception, it quickly became obvious that the profound and crushing sense of isolation and loneliness that Glyph represented had struck a chord in readers. As Moore put it, “the response to this story of a terminal nonentity was surprising in its intensity and I think that, maybe, that was the episode where we finally got the readers on our side.” Certainly IPC was finally on side, commissioning a third run of Halo Jones and this time asking for a twenty part saga instead of the ten part runs of the first two books. Moore, however, was too busy with his DC work to commit to that, and so The Ballad of Halo Jones Book Three was set at fifteen parts. 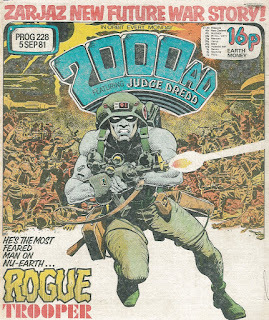 Figure 808: The 1981 debut of Rogue Trooper. 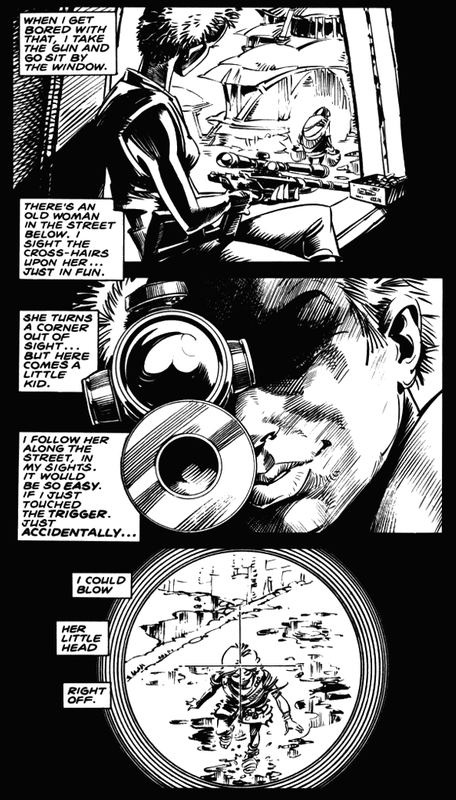 The third book of The Ballad of Halo Jones saw Moore and Gibson tackling a particularly iconic trope within 2000 AD, namely the war comic. 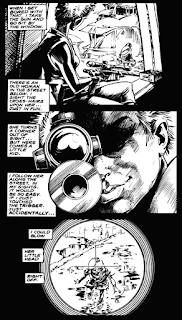 As Moore puts it, “future war has always been the most popular topic among the 2000 AD readership, and it seemed to me that the time was ripe for a story that looked at the concept of war in the future from a slightly different angle to the more traditional one.” This angle, at least in 2000 AD, was best embodied by Gerry Finley-Day’s Rogue Trooper. Finley-Day was in many ways the epitome of the IPC establishment, having joined the company in the early 70s and, like Pat Mills, gotten his start on girls comics, editing Tammy (where he’d created “Slaves of War Orphan Farm”) before following Mills to work on Battle Picture Weekly and Action, and finally becoming one of the mainstays on 2000 AD, starting as the writer on Invasion! and going on to write a variety of titles for the magazine. But it is Rogue Trooper, the story of a genetically enhanced soldier who had the digitally preserved consciousnesses of his fallen comrades embedded into his equipment. Finley-Day, however, could be difficult to work with. His scripts were infamously sloppy (a famous early typo in an Invasion! script in which Finley-Day attempted to have Bill Savage escorting men across a plain led to the coining of the word “scrotnig,” a favorite term of Tharg the Mighty), and the general attitude was, as Alan Grant put it, that he “was really good at coming up with ideas,” but “didn’t know how to realise” them. Grant, who’d had to near-completely rewrite his scripts for Harry 20 on the High Rock, more bluntly describes taking the scripts to editor Steve MacManus and saying “we can’t print these scripts the way they are - the sentences don’t make sense, the word balloons are way too long,” and having to cut around sixty percent of the scripts to make them work. Dave Gibbons, Finley-Day’s initial collaborator on Rogue Trooper, gave a similarly scathing assessment, explaining how he broke from his usual practice of lettering stories he did art on because “I got so pissed off with the scripts on Rogue Trooper that I didn’t even want to read them. Steve would précis the script, give me a plot and I would draw it from that. Then someone else would letter it, because I couldn’t bear to read the words, quite honestly.” And so, over the course of the 1980s, Finley-Day steadily found himself eased out of the magazine, with his last contribution being a Rogue Trooper arc that ended in Prog 449, two weeks prior to the debut of The Ballad of Halo Jones Book Three. 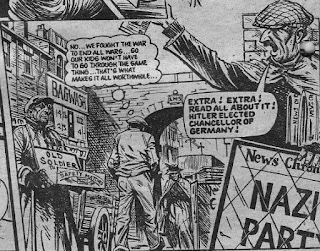 Moore, on the other hand, was interested in returning to an older tradition of war comics, remarking that “among the majority of future war strips that I had come across, none came even close to matching the depiction of inhumanity and misery conjured up by Pat Mills and Joe Colquhoun’s masterful Charley’s War.” This was a 1979-debuting strip in Battle Picture Weekly featuring the exploits of Charley Bourne, a working class lad in the usual mould for Battle Picture Weekly: scrappy and possessing a strong sort of practical common sense that is (of course) far more valuable than any sort of book learning. But while the setup of the strip (Charley enlists at the age of sixteen, lying about his age, but forgetting to change his birthday on his paperwork) is bog standard for a British war comic, the tone is markedly different. Charley’s War made no bones about the horrors of World War I, with Colquhoun and Mills both meticulously researching the period so that the actual war content reflected the awful intensity of the actual First World War. The strip also contained Mills’s trademark satirical streak, which became particularly savage in the sections set in England. This included an extended story arc set in London while Bourne is on leave, featuring Blind Bob, a blind Crimean War veteran. Bob is a classically grotesque character of the sort common in British comics, and he provides no shortage of comedic moments over the course of the story, but it’s a fundamentally tragic story about an old man, disabled in the service of his country and largely left to rot, ending with Bob throwing himself in front of a truck in (tragically mistaken) despair at the prospect of being sent to a workhouse after being integral to saving London from zeppelin raids. It’s at once darkly funny and an absolutely scathing indictment of the treatment of veterans. 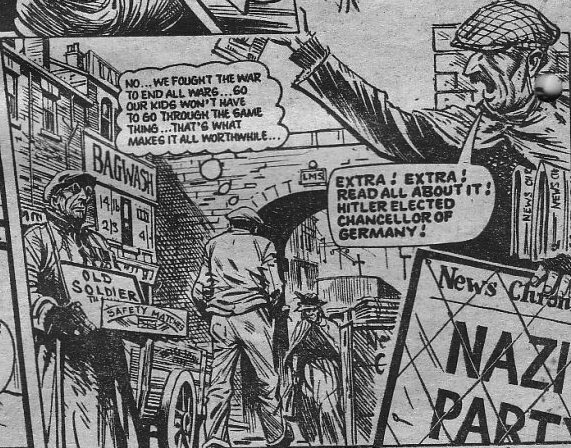 A similar tone exists in Pat Mills’s last contribution to the strip, which flashes forward “Thirteen years later… January, 1933.. Charley was one of the many ex-servicemen who had been unable to find a job and spent years on the dole.” The strip then shows Charley’s life, being harrangued by Mister Bickers from the Labour Exchange, who angrily reminds him that “if any child does a newspaper round or does errands, the money must be deducted from his father’s dole” before demanding to inspect the Bournes’ larder, before ending with Charley musing to himself that “we fought the war to end all wars… so our kids wouldn’t have to go through the same thing… that’s what makes it all worthwhile” as he walks past an old soldier selling matches and a newspaper salesman proclaiming that Adolf Hitler has just been elected Chancellor of Germany. Moore was interested in bringing this sort of approach to futuristic warfare, feeling that “since warfare seems to become increasingly horrifying with each passing generation” it was strange that comics were “only capable of bringing home the full gut-wrenching impact when describing the conflicts of the past.” He had prior form in this regard, of course; he’d already written a pair of Rogue Trooper stories for the 1983 and 1984 2000 AD Annuals, both of which looked at the psychological consequences of war, a marked departure from the usual tone of a Rogue Trooper story. But there’s a considerable difference between introducing and killing off a psychologically scarred character over the course of a six-page strip and a fifteen-part look at future war of his own devising, and Moore unsurprisingly went considerably further with The Ballad of Halo Jones. The central horror of future war that Moore imagines, occupying the eighth through thirteenth installments of Book Three, involves the planet Moab, “the single biggest non-gaseous planet so far encountered by humanity.” Slightly larger than Jupiter, the planet has massive gravity, requiring all combat to take place in massive gravity suits, rendered by Ian Gibson as massive, vaguely mushroom shaped things that look more than faintly ridiculous. But underneath the slightly ridiculous visuals (which, along with a healthy degree of gallows humor from Halo, keep the strip grounded in its satirical lens) is a solidly gruesome concept. Moab’s gravity is such that exposure to it instantly reduces soldiers to bloody smears if there is any failure in their gravity suits, including, of course, being struck by a bullet. Even grislier, the gravity in the actual combat zones is sufficient to cause massive time dilation, so that in combat events happening even a couple dozen meters away seem frozen in time, slowly accelerating as one approaches them so that, as Halo describes it (in a caption box, Moore having by this point thoroughly abandoned the structural constraints of Book One), “the bullets inch forwards. The spray of arterial crimson descends gradually - a slow, hideous dew,” until finally one is in the thick of the terrifyingly deadly action. the war, as everything becomes a blur, entire years of war and politics passing outside the Crush over the course of a week or so for Halo, until suddenly one day all the fighting just stops, and Halo and her fellow soldiers emerge to find a lone cleaning woman who explains that the war has been over for weeks, ever since Earth’s economy collapsed. Moore's influences extend beyond just comics for HaloJones Book 3. The sequence with Toy you mention toward the end of this part is hugely indebted to a sequence from All Quiet on the Western Front, although I don't know whether Moore took it from the film or novel. There's an interesting sidebar to any creative endeavour on War from the seventies onward, in that before this point almost anyone involved in the UK would have had direct experience, either in battle or at home, and this would make interesting creative decisions that would possibly be lost on the post war generation, Moore included. The most obvious one comes in the wake of Patrick Macnee's death yesterday where it was revealed that his character Steed in the Avengers never using a gun was his choice based upon his experiences from the Second World War. And of course the time dilation effect causing soldiers to return from the battlefield to a transformed society owes, let us say, a considerable debt to "The Forever War". Nonetheless, Moore turns these building blocks into an incredibly effective story, and one which I still vividly remember reading for the first time as it came out, when i was 13 years old. In particular, the whole sequence of Halo trying to make it in civvy street, her PTSD (including those powerful panels Phil has included in this post) and her eventual re-enlistment packed a hell of a punch. I very much agree-- I only feel Moore's sampling should be mentioned because it is pertinent to the War. Halo Jones is one of the three works from Moore that I can still revisit and enjoy- for some reason many of his other works haven't aged as well for me. Whether that is from over familiarity or simply being affected by the War, I do not know. Oddly enough, I seem to recall the first book of Halo Jones occurred during one of the times in the 80's where I stopped reading 2000ad- I think the first Halo Jones I read was the final part of book 1, and really I only met her properly for book 2 and liked it from the start. So I can't say what pure, I editorially affected Halo Jones had on my early teenaged self, beyond loving Ian Gibson's art in the aforementioned final chapter. But for me, Book 2 got the balance right for her, and book three was a masterpiece that I rate almost as highly as I do V for Vendetta. (My other favourite Moore work is Captain Britain-- and I really don't know why that one has staid in my affections when others that I rated so highly at the time such as Marvelman have lessened). Gah! I really should learn not to try posting on blogger with an iPad, as blogger hates Apple products. Please excuse my bad internet etiquette by replying to myself, but I have realised why Moore's early work still appeals to me while much of his other work no longer does so. Due to the constraints of working in ostensibly children's entertainment, Moore is forced to abandon, or at least disguise, sexual violence toward women. The closest he gets is Book 2 of Halo Jones and the whole Toby plot. 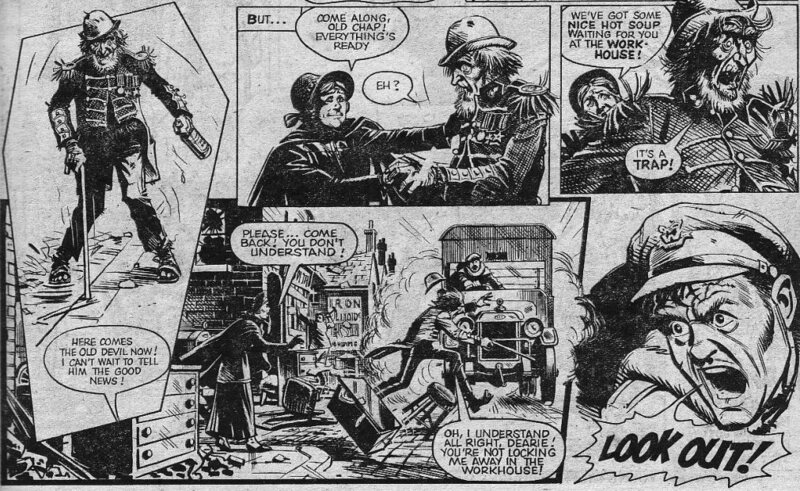 But like many in 2000ad he is forced to use metaphor and robots instead of depicting the obvious. So Toby literally represents men as animals driven by their programming, and chasing a woman to make her his. Similarly, Book 3's depiction of war as something fought by women voids some of the sexual violence tropes found in war films of the 80's. Halo Jones, Captain Britain and V for Vendetta are also some of the only stories Moore writes in the 80's where there are more than a couple of women in the cast, which gives a more nuanced view of gender that I find missing in his other works from the time. Sexual violence in fiction is something that I find repellant and something used too frequently-- it's one of the reasons I don't watch Game of Thrones, and one of the reasons I fell out of love with Moore as a writer. Replying to yourself is bad internet etiquette? Yikes! "...and I know that thing you do with your hand is very bad, but..."
Synchronicity wise, in the wake of dear Patrick Macnee's death, Ian Gibson would later collaborate with Grant Morrison on a neat Avengers comic (published as Steed and Mrs. Peel to avoid Marvel going after them), "The Golden Game". Hardly their best work ever, but a fun little 3-issue comic that reads much like a good episode of the TV program with the usual lack of budget constraints that come from being drawn, rather than filmed, and that managed to get Diana Rigg to guest star during the Linda Thorson period of the show (a series 7, before The New Avengers presumably, and sadly sidelining poor Ms. King for much of the action). The follow up story by Anne Caulfield about Mr. Peel isn't too bad either. Not necessarily comics you'll enjoy as much if you don't already like The Avengers, but a fun time if you do. I just wish the trade edition hadn't been misprinted so badly. Some of the inks are shifted, pushing the black outlines a good half centimeter off of the colors. Should have been caught in QC and corrected. If we're playing spot-the-sample then also worth mentioning Life Sentence, whose collecting ears game is straight out of Michael Herr's book on the Vietnam War, Dispatches. An English teacher set my class Dispatches as reading a couple of years after HJ3 came out, and I very excitedly said wow this was in 2000AD. Sadly he had not got the memo that wham, pow, comics aren't just for kids any more, and was super unimpressed by my information. 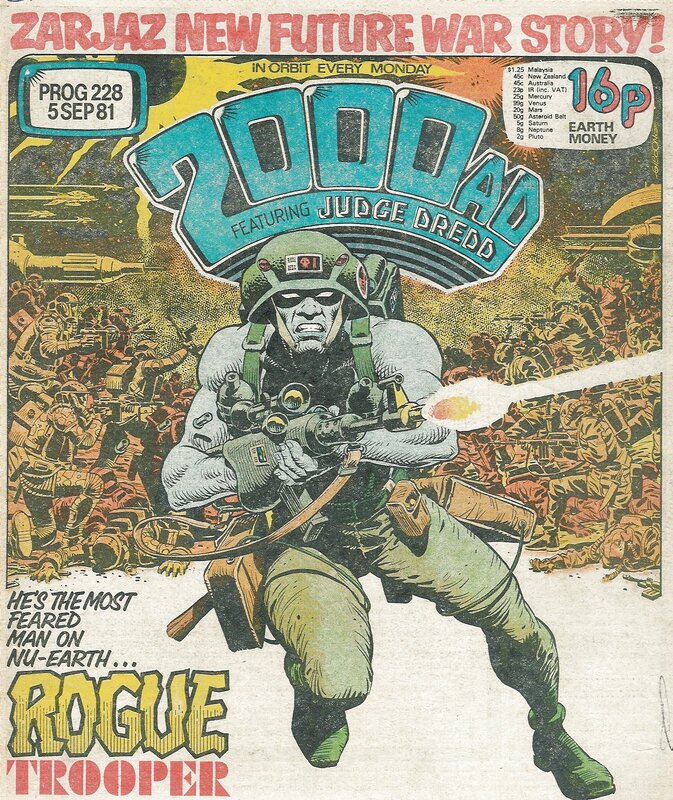 I recall as an avid reader of 2000AD, Rogue Trooper catching me enough to be interesting for a while, but I even as a kid got bored with it as really it seemed to go nowhere and never really explored any real responses to war.